You can do much of your whitetail scouting right from the comfort of your home. All it takes is a topographical map, or one of the great new interactive computer `topo' (TOE-poe) maps, and an understanding of how terrain features affect deer movement. Skeptical? You're probably already aware of how effective hunting `funnels' for deer can be. Well, consider that many funnels are created by certain terrain features. If you can spot these terrain features on a map before you enter the woods, you're way ahead of the game when it comes to picking a killer stand site. 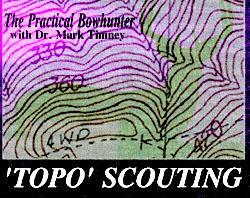 This column will introduce you to the idea of `Topo Scouting.' First, I'll explain the very basics of reading a topographical map, and then describe the terrain features I look for when planning a hunt. "topo1.jpg" here. using, describe the land's ups and downs. This is done through CONTOUR LINES. These brown lines show points of land that are at equal elevation above sea level and always form an irregularly shaped closed loop. 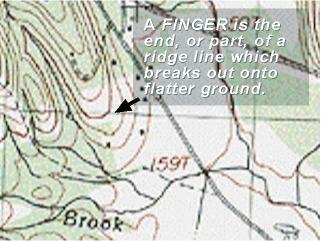 There are `thin' and `thick' contour lines. The thick lines are CONTOUR INDEXES, and they're special in that somewhere along their length you'll see a number indicating the land's elevation at that line. 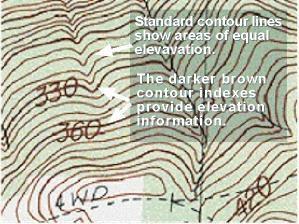 Thin contour lines show how slowly or quickly the land changes elevation between the contour indexes. 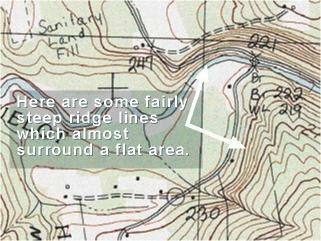 Contour lines usually occur at intervals of 20 or more feet. 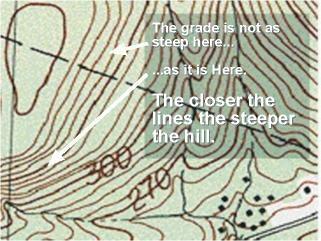 The closer the spacing between contour lines the steeper the slope. A vertical cliff, for example, would have most of its contour lines falling on top of one another. Peaks, sometimes called summits, are easy to spot. 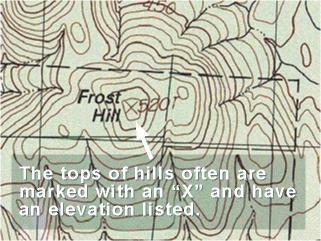 They're indicated by the innermost ring of a series of contour lines, and are often marked with an "X" and the elevation. Here are a few other terrain features as they're depicted on a topographical map. Color is used on some topo maps to help enhance the information presented. Blue shows where there's water. Green indicates wooded areas or land that is covered with substantial vegetation. White means the area is clear, sparsely vegetated, or being farmed. 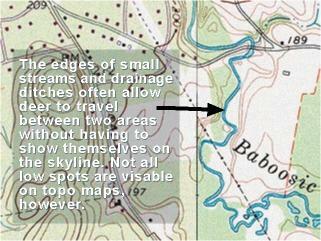 Don't be surprised, however, if your topo map doesn't match the real world as it relates to vegetation or woods. The map may have been made 30 years ago and much can change in that time. If you could get to the same place by climbing up a steep hill or walking up a moderate grade which would you rather do? Most of us would take the latter. And guess what? Deer will take the easy route if they can too. Knowing this makes scouting by map much simpler. Topo maps show you the "easy routes." You just need to pick the ones where the terrain will send deer through a small enough area. The first thing I look for are SADDLES. 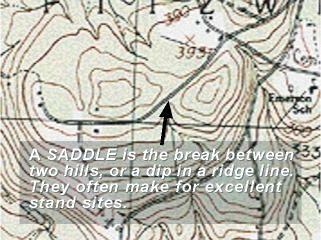 A saddle is a dip in a ridge line (or sometimes a "pass" between two peeks.) Such dips in the terrain are natural funnels. The ridge line doesn't have to be high for deer to prefer to cross at the saddle. Sometimes a difference of just 10 feet is enough to influence their travel patterns. I like to find saddles that connect `bedding areas' with `feeding areas.' These are great for morning and evening hunts. I especially look for smaller saddled because they're easier to cover from end-to-end. BENCHES are also great natural funnels. 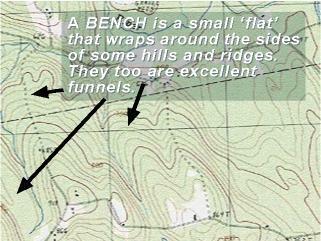 A bench is a flat, or at least flatter, section of ground along the side of a steep ridge line or hill. It's not unusual to find a well traveled deer trail along a bench. Natural gas pipelines and old logging roads often make for great benches as they are narrow and perfectly funnel deer past a stand. DRAINAGE DITCHES an STREAMS split open areas and link two patches of cover are also excellent natural funnels. Deer use them because they allow them to travel out of sight. Unfortunately, many ditches won't show on topo maps because the interval between contour lines may be too great to show a such a shallow cut in the land. Streams, however, usually show up well. There are other terrain features that influence deer movement, but there isn't the space to go into them all here. You can do that on your own, however. Just look for the easiest route to get from one point to another on the map. A deer may very well use the same route too, and someone along that route there may be a funnel waiting for you. Where Do You Get Topo Maps? The easiest way to get a topographical map of your area is to go to your local Soil and Water Conservation office. If you need maps for another state, you can sometimes find them at larger sporting goods/outdoors stores, or order them directly from the government (Earth Resources Observation Systems, User Services Section, U.S. Geological Survey, Sioux Falls, SD 20505, 703-351-2053). Remember, topo scouting isn't a replacement for traditional scouting. But it is certainly the most practical way to pick areas that you'll want to check out on foot. You may even find that you can spend less time scouting and more time in your stand because of it. Good Hunting!